Just a quick post about our trip to Bavaria and look what Jake found! 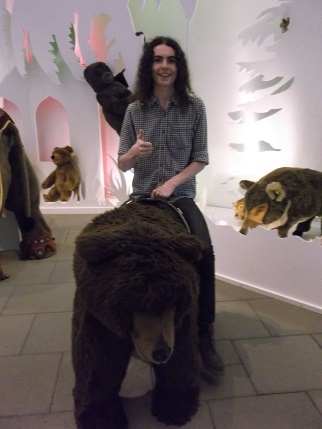 Here he is with his bear (admittedly a stuffed one) in the Steiff Teddy Bear Museum which was an unexpected bonus to a fab trip away. The holiday was ace – you know when you see pictures of a place and think that it can’t be that nice, well it was. Bavaria is beautiful, full of castles, mountains, cute little villages and medieval towns and we had a whistle-stop tour of some of the loveliness. 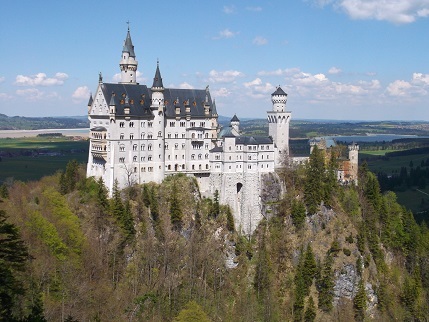 The pictures below show the amazing Neuschwanstein Castle and the town of Rotenberg ob de Tauber. Would love to go back and explore more sometime. 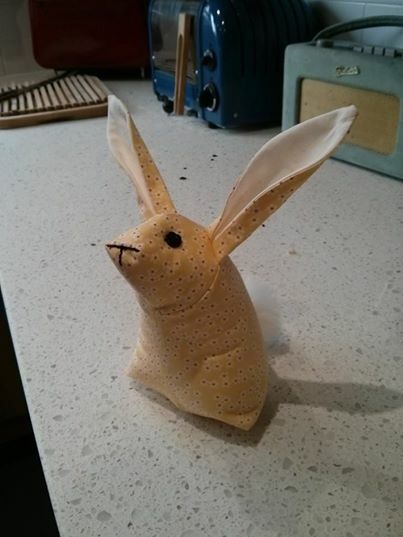 Have so many beautiful things to share with you but this is just an interim post as have no time this week, off for our first event in Sherwood Forest this weekend so in between work, getting ready for that and the finishing of another bunny for a special baby am very short of time. Have a lovely weekend ahead and thanks for visiting. This is a catch up post really (on the grounds that there are no finishes to show at present) and I have been meaning to post a couple of things for a while. Firstly my very talented friend Helen (she of the quilts) is also making other things including these cute bunnies just in time for Easter. She will have some for sale through her Etsy shop at some point for £6.50 but if you are interested please go and visit her at the new blog she has. 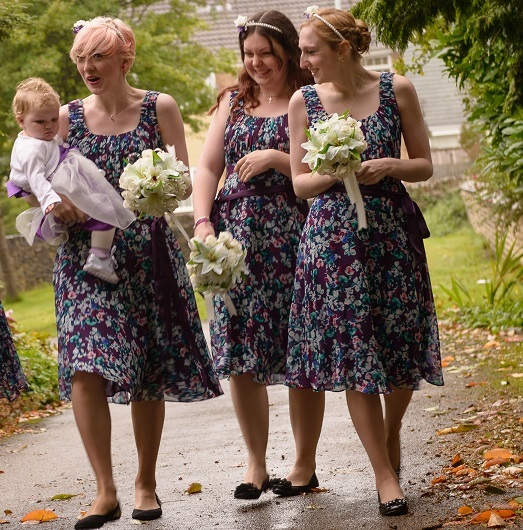 And I have been meaning to post some pics of Ellie as a bridesmaid at her friend’s wedding. I just got the disc from her so here she is looking very lovely. 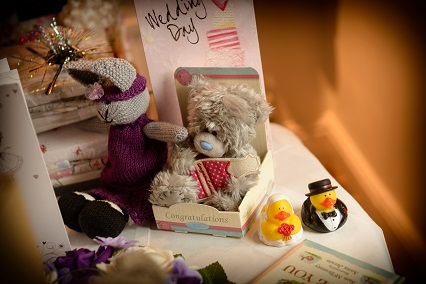 The baby in the photo is the friend’s little daughter Lizzie who I made a bridesmaid bunny for, you can see the bunny on one of the present tables in the last picture. 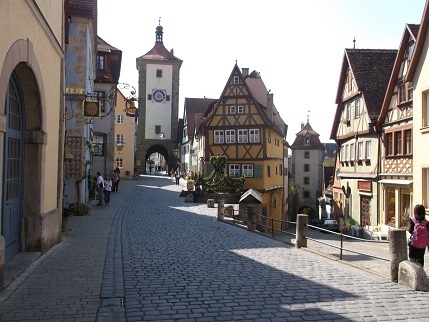 My lovely Mum will be here next weekend (it is her birthday on Friday) and then we are off to Bavaria (or Bearvaria as Jake keeps calling it – think he is expecting to see some bears) for a week of visiting medieval towns and castles. Very much looking forward to it and as usual will take lots of photos! See you soon, thanks as always for visiting. Hello everyone, hope that you are having a lovely weekend, I am still knitting bunnies but turning my thoughts to other things as well as work is easing off and I have the summer coming up. 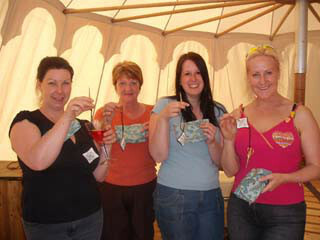 In and amongst the kit making I am planning some other stitching projects. 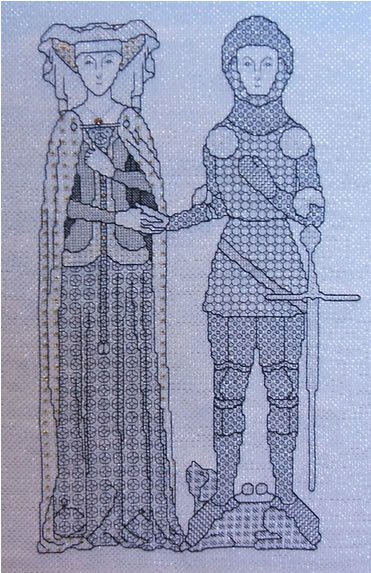 It is while since I did anything stitchery apart from exchange pieces and Xmas ornies but am musing on some long-term projects (would love to do another big goldwork piece) and have some more blackwork gifts planned for later in the year. 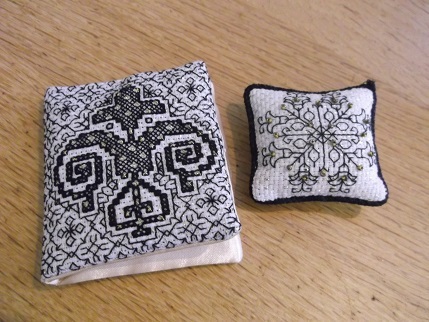 I love doing blackwork, have not done any for so long and was reminded of my passion for it when Kerry brought up her sewing basket with her for our dress making weekend and there were the needlecase and scissor fob I had made for her some years ago. 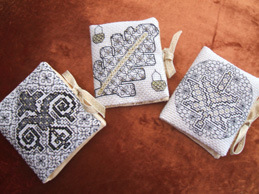 This was one of the sets I made for the girls in my old medieval group, here they all are with their gifts, these were done in 2009.The picture below shows Kerry’s needlebook along with the two others I made. A couple of years earlier I did a piece for a friend’s wedding, they are re-enactors so I thought they would like this piece based on the effigies we see (and use for costume research) in many churches. 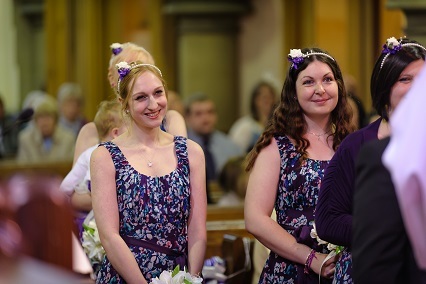 Hope you are having fun whatever you are doing, thanks for visiting.